I don’t think that you can create Things in PaperUI for Exec2. If you go to Configuration -> Things and hit the + and you don’t see Exec listed, you must use the text based .things files. Once you have the Thing you can probably create the Item in Configuration -> Items. 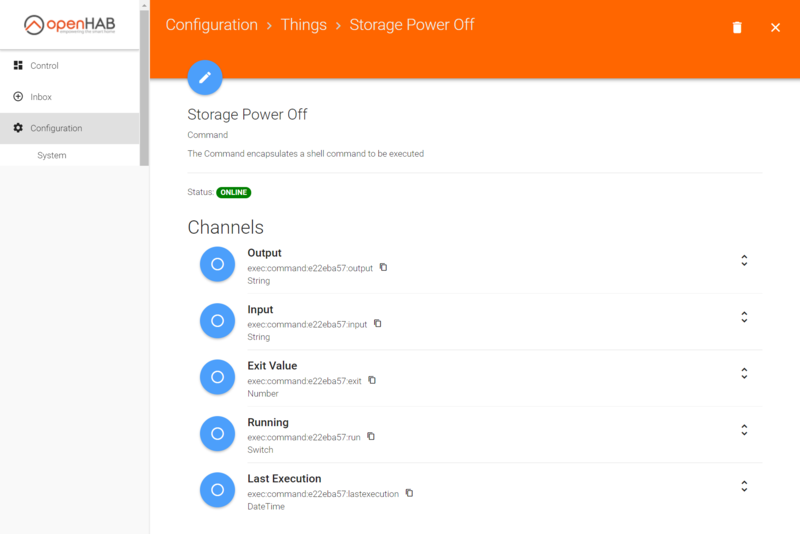 See http://docs.openhab.org/configuration/things.html#defining-things-using-files for how to define things in text config files. 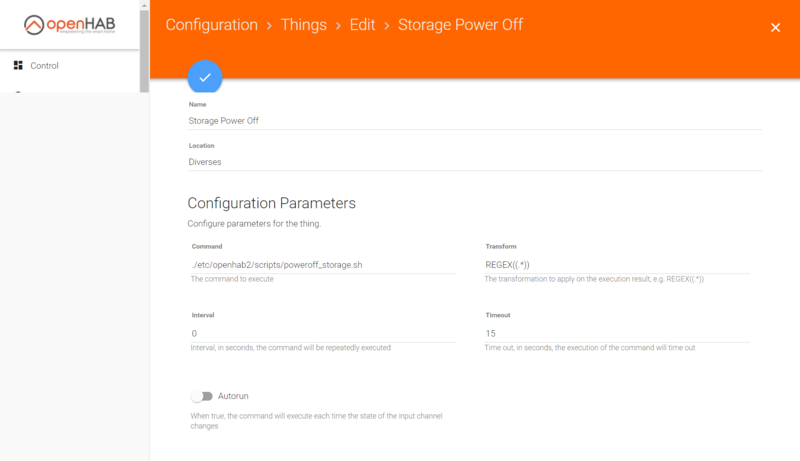 See https://docs.openhab.org/addons/bindings/exec/readme.html for how to define the Thing if you need more information on how to format the Thing. Exec is listed under “things” within the configuration. But there is no switch to run the script. Already tested all possible channels. You have to create an Item linked to the RUN channel to trigger the script. Or, if your script takes arguments then you sendCommand to an Item linked to the input channel. Please read the Exec binding README. I’ve read it and as I wrote I already tried all of the items. The switch is not “clickable”. I’m not able to use it. That’s the Thing. PaperUI only shows Things. PaperUI is not intended to be the User’s Interface for your home automation. It is an Administration UI. As such, it provides the Control section and lets you interact with SOME of your Things for testing purposes. But for this you need to create a Switch Item, put that on a Sitemap or HABPanel, and tell the Script to run from there by toggling the Item. Didn’t know that, thank you. script is running fine… tested it with the openhab user from command line. Thats the one its executed by the exec binding, isn’t it? Yes, the openhab user is what your script will run as. Try the various suggestions including replacing spaces with @@ and using executeCommandLine so you can see the result when the script fails. I was able to get it work now. Now I’ve made a other script for waking the server up. One Item with the switch type (because i need a switch for alexa integration), that if its put “On” it runs the power on thing and if “Off” it runs the power off thing. How does the iteem need to look like? Managed to get everything to work. Here is exactly what i’ve got if somebody needs it. This is used to power on my synology nas with Wake On Lan and to power it off by ssh. #Admin-User of Synolgy, must be active and the default user "admin"
Any change to power off the synology without exec binding? I mean, with OH in a Docker container? Any change to power off the synology without exec binding? You could run the script in a rule using executeCommandLine instead of using the Exec binding. an external script outside the container? Or a script inside the container but calling apps outside the container? Your need to have something outside the container that OH talks to to issue the command. The shutdown command probably doesn’t exist inside the Docker image and if it did I doubt it would be allowed to run, it at best it would shutdown the container. One of the whole points of containers is to prevent apps from doing this sorry of thing. u could run the script in a rule using executeCommandLine instead of using the Exec binding. It’s the same problem. Inside the container there are a limited set of executables available. Ping isn’t even there. I still don’t think a Docker container will be allowed to shutdown the host is running on. That violates all sorts of container principles. Just thinking loud … that means I’m not sure OH should be the right app to put in a container … as the strength of OH is to communicate with things all around … does it make any sense? Edit: no, it doesn’t you are right, but at least it should be able to shut down another host (in case, for example, you have OH in a server, and your media center in another nas). Makes sense? You could run a cron job that runs a script that polls the state of an item through the REST API, and depending on the state, could power off the NAS. It depends on your needs and requirements. For you and many it may not be a good choice. For me and others it’s perfect for our needs. For still others it’s their only option. There are over 330 bindings. If only 329 of them work in the Docker container does that negate it’s utility entirely? Not in my opinion. I am pretty new to the topic of openHAB2, so I got some questions concerning your script. Just to test with my Synology I tried to copy/paste everything to a fresh install of openHABian. Bindings used were WOL, NETWORK, EXEC. The WOL function and Status function work without issues, but I have issues with the shutdown. The errorlog always gives an error that it cannot run script “error=33”. My assumption is that the openhab user does not have the rights to run the script. I also tried changing user and group in /vusr/lib/systemd/system/openhab2.service to root:root but it did not work. Basically what I want to do is, have a Sitemap-switch that gives status of NAS and can WOL the NAS, as well as shut it down. SSH commands I cannot get working because I dont want to mess with my NAS (ssh.key login). Is there any other way? I mean the DS Finder app on my phone can shut the Synology down without issue/messing with ssh keys and so on.